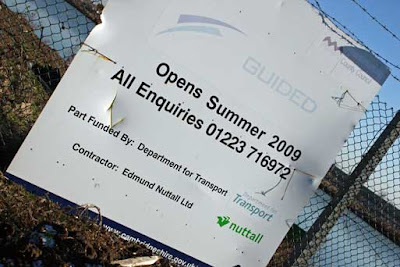 BAM Nuttall, the contractor building the Cambridgeshire Guided Busway is being fined £14,000 for each and every day that the scheme overruns, expected to total around £4.7 million (335 days). The news broke in trade magazine CBW this week, with neither BAM Nuttall nor Cambs CC admitting to the way in which a fine was being applied or its price. Both parties are also in dispute over the total cost of the scheme, with BAM Nuttall thought to have claimed between £30-50 million, despite the balance between the amount offered by central government (£92.5m) and the total scheme cost (£116.2) being significantly less. The financial damages applied to BAM Nuttall have been awarded since February 2009. The delay in the Busway's opening is evident in the signage displayed here. LEYTR Comment: The first blow to what many must surely be contemplating calling the 'ill-fated Cambs Guided Busway' was the delayed opening. Twice. 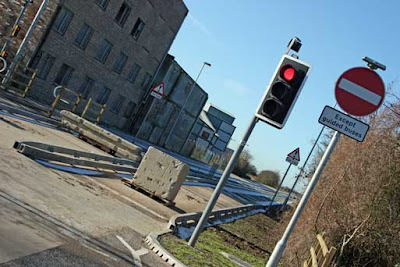 The frustration felt by the county council, being effectively in the contractor's hands, was clearly being felt early-on, with the £14k-per-day fine having been applied for almost a year. 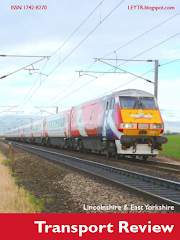 The second blow is the revelation that the conversion of the former railway track bed to guided busway cost considerably more than the re-introduction of a heavy rail service. Thirdly, the spat between contractor and county council that is likely to see arbitration made in court. Fourth is the annoyance being made by the two bus operators, who've both substantially invested in buses worth £3.5 million for the incomplete route. Fifth - and most importantly - the image being portrayed will not do the cause of any other proposed guided busway any good whatsoever. The scheme needs completing and completing fast. Photos reproduced with kind permission of CBW/Gareth Evans.